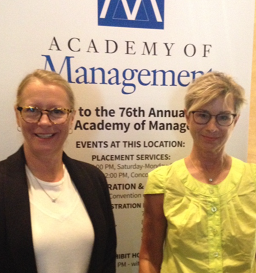 We were honored once again with the opportunity to present our work at the AOM. We packaged our interactive message within a unique blend of research and practice as we spoke and demonstrated at the Academy of Management Conference in Anaheim, California. Two members of the Strategic Play team, Dr. Margaret Rudolf and Jacqueline Lloyd Smith, discussed how the members of the Strategic Play® team use LEGO® SERIOUS PLAY® methodology to facilitate organizations around the world. They also explained the research that solidifies this practice. Driven by technology and globalization, people are experiencing change at faster rates than ever imagined. This has created a demanding environment, but people continue to strive to find meaning in their work and within their organizations. Making meaning and finding meaningful connections is a necessary component to what it means to be human and to have a human experiences. People need to connect, to belong, to understand, and to make sense of their lives. Well designed and facilitated LEGO® SERIOUS PLAY® workshops assist in this process. During this interactive presentation we systematically “unpacked” a number of LEGO® builds as we compared, contrasted, and analyzed the process, illustrating and demonstrating the making of meaning. We then linked each build to research findings illustrating the power of LEGO® SERIOUS PLAY® and the current science of why it works. Once again, this year’s audience consisted mainly of academics. They were interested in learning how this methodology works in a variety of industries with multiple demographics. We were able to provide colorful examples from our work around the world, with everyone from medical specialists to local governments. Playing with LEGO® bricks enabled the academics to hear, see, and experience the research and practice in motion. Through highly visual photographs that spoke for themselves about the power of play, along with numerous builds, we illustrated research points regarding engagement no matter the industry, education, culture, age, gender, or nationality. Presenting at this conference allowed us to further connect within the academic community, paving the way for future collaborations and new research opportunities. Please feel free to download a summary of the research we presented.